I am nearing the home stretch on Gattegno Textbook 1. It's been nearly two years of blogging on this textbook. We are ending the Number Studies series by writing a math composition. What is a math composition? I've discussed compositions before here. 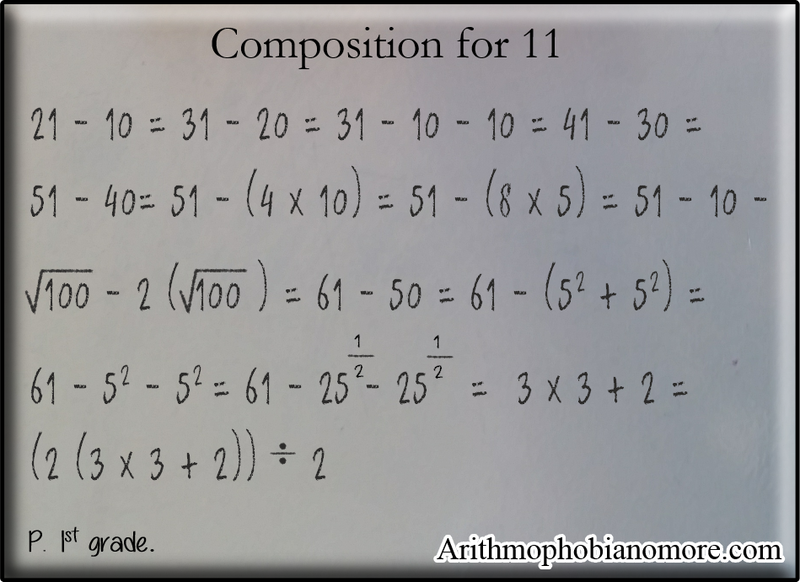 The short answer is that a math composition is a collection of expressions a student writes for a given number or situation. At the end of a number study, I ask P to write as many expressions as he can for that number. As our students have more experience, their compositions should be getting longer, more complicated, and more creative. This is where you learn what it is that your student knows. You can set up constraints from the beginning, but don't interrupt your student with talking while they are trying to think. It does't matter how long the composition is, certainly not in the beginning. The important thing is that they are taking their ideas and turning them into symbols. Math primarily happens in the mind. It isn't something that happens with rods or symbols on paper, it is mostly a mental activity. Compositions are also a mental activity. I've had people email me and say, "How would I show this with the rods . . .?" It will be something with multiplying square roots, or negative polynomials or something like that. And I often reply, "You don't". You don't because there is no reason to. If you are showing that with the rods you need to back up. We aren't looking to make every situation concrete. We want students to have absolute mastery of the symbols so that they can transform any situation into something else. Sometimes for fun, we make expressions more complex, but usually we transform them into something easier to deal with. What I am looking for is not the number of individual facts that P. can remember or which facts he can remember, but rather his ability to apply the general principles of addition, subtraction, multiplication, division and fractions to a specific number, begin anywhere and transform what he knows into multiple expressions. There are clues I'm look for in his writing. The expressions in the image below were taken from P's composition. When P is dictating his composition, I am noticing and wondering. What I am interested in is P's thinking. We talked about adding 10's to 11 to grow larger numbers. He easily transformed what he knows about addition to subtraction. And then, you'll notice, he keeps using that information to generate more math. P. is pretty consistent in his compositions. He starts with something and works systematically. This is an improvement from our work in chapter 3 where he was throwing out ideas and facts with no discernible order. Here he starts with 21 minus 10, then he adds 10 to 21 and subtracts 20, then adds 10 and subtracts 30, then adds another 10 and subtracts 40. These transformations come from our work with common difference and staircases. He knows that 40 is the same as 4 x 10 so that was an easy transformation. He split the 10's in half and then doubled the 4 to 8. I find this interesting as we haven't worked a lot with halving and doubling, but since he is already doing it with tens, I know he is ready. I will pull this composition out and we can talk about his thinking and then extend the idea to more complex halving and doubling. We just talked about how a nickle squared = a quarter. And two nickles squared = an fifty cent piece. I also notice that he has taken his knowledge of multiplication and applied it to square roots. He keeps on this path by using his knowledge of the operations to create more math until he decides to go in a completely different direction with 3 x 3 + 2. He then pulled his favorite math trick - perform an operation and then the inverse. He multiplied by 2 and then divided by 2. That kind of thing makes him laugh. What I know from this is that P is very comfortable manipulating 10's and he's got a good idea about how they work with all the operations. He's got a pretty good idea about squares but not cubes even though we've played with them a bit. Now, it could be that he just didn't think of using them on this composition. He is starting to use fractional exponents and square roots, but this is new. I suspect he is only comfortable with 5's and 10's. We'll want to play more with the language soon. While this is the end of my posts on number studies for textbook 1, it is certainly not the end of our work with 11. We also did multiples of 11 and noticed and wondered. I didn't blog about it because Gattegno hasn't introduced multiples yet. I also didn't include the substitution game for 11. That game has more to do with transformations not with a specific number. We have a substitution game going all the time. That needs a separate post of it's own. In the course of our study, we accumulated a lot of paper on 11 study. Every single thing written was generated by P. In the introductory exercise and concluding exercise, P. was allowed to be creative. The middle exercises were more about making a study of and learning as much as we can about a number; tracking that data; and once we have a more studies under our belt, looking for patterns. 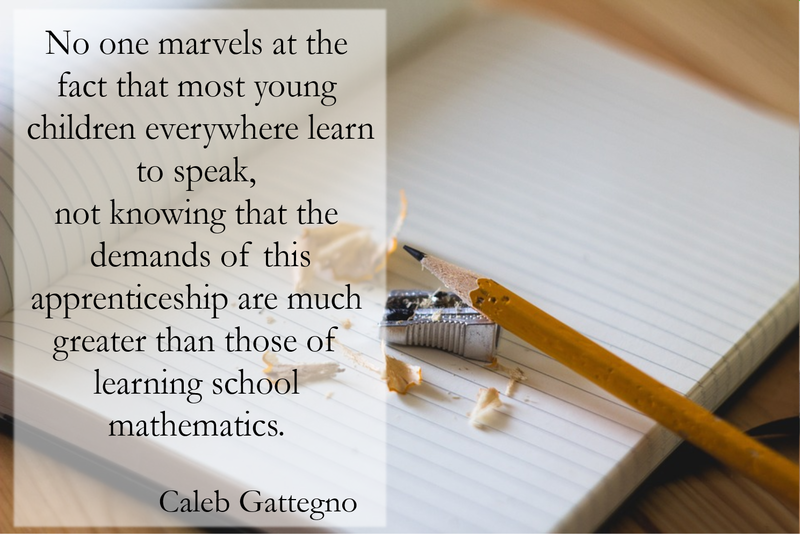 If you follow Gattegno's approach, there is simply no need for workbooks. A workbook is certainly not going to provide you with the kind of feedback that a composition can. Nor are workbooks going to allow a student to make an serious study of any particular number or situation. learn the secrets of how equations are made. The following video contains our number study for 11. There is certainly more that we could have put in here. As P learns more, we may come back and apply it to the study of 11. We didn't use any of Lacy's notebooking pages for our study - which would mean we could extend this study for months, but it would get boring. If you's like to learn more about number studies or Gattegno, you can find all my posts on his textbook here. If you'd like to meet other parents and tutors using base ten blocks to teach math, you can join us on Facebook here.